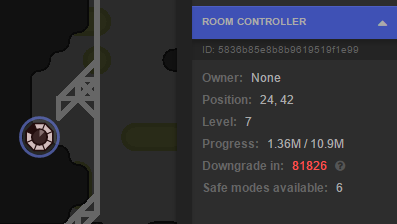 Wouldn't making the timer half filled after an upgrade make safemode unavailable for some time right after each controller upgrade? Or is that the whole point of that change? When a creep on a room exit does a ranged attack and then gets teleported to the other room (especially if bounching back and forth between rooms), the animation of the attack is displayed in the wrong room. Currently seeing vertical lines across the whole room for the attacks on the botarena private server. Thank you very much, hopefully we'll get it to work now. On private servers currently, Invaders and Source Keepers do not perform any actions, and trying to check their owner.username results in errors about undefined having no username property, even if first checking if .owner returns truthy. The first problem may be caused by the second, but that I do not know. When RCL finally changes, GCL also starts changing. On the private server, the controller progress keeps going up above the max for the rcl without it leveling up.